Edith Stein was born the youngest of 11 children in an observant German-Jewish family. She renounced faith as a teenager, but as a student at the University of Göttingen, she became attracted to Roman Catholicism and converted in 1922. She received her doctorate in philosophy at the University of Freiburg and joined the faculty; after her conversion, she became a teacher at a Catholic girls’ school in Speyer. In 1932, she became a lecturer at the Institute for Educational Studies at the University of Münster, but the Nazi laws forbidding Jews to teach forced her to resign the following year. In 1934 she entered the Carmelite convent at Cologne, taking the religious name Teresa Benedicta of the Cross, after the mystic St. Teresa of Avila whom she said had inspired her conversion. At the end of 1938, following the attacks on Jews known as Kristallnacht, she transferred to a convent in the Netherlands, where it was thought she would be safe from persecution. However, this was not the case, and in 1942 she and her sister Rosa, also a Catholic convert, were deported to Auschwitz, where they were killed. 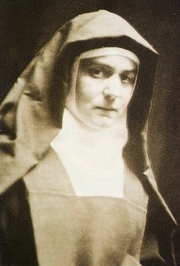 In 1998, Edith Stein was canonized as a saint by the Roman Catholic Church. Edith Stein is currently considered a "single author." If one or more works are by a distinct, homonymous authors, go ahead and split the author. Edith Stein is composed of 11 names. You can examine and separate out names.